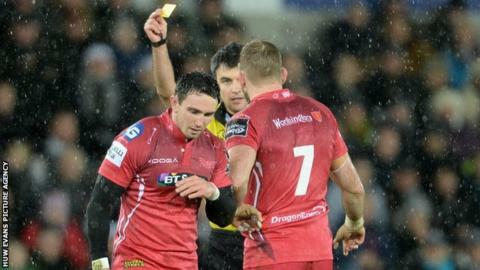 Scarlets wing Kristian Phillips will miss three games after being banned for a dangerous tackle on Osprey Dan Evans. Phillips' late tackle on Evans came early in the first half of the Scarlets' 17-15 defeat by the Ospreys at the Liberty Stadium on Saturday. Referee Marius Mitrea showed former Ospreys player Phillips, 24, a yellow card for the offence. Phillips, who pleaded guilty, will miss Saturday's return game against Ospreys, and trips to Glasgow and Leicester. This type of offence usually carries a four-week playing suspension, but the disciplinary committee reduced the ban to three weeks after considering the player's exemplary disciplinary record. After the game at the Liberty Stadium, Scarlets head coach Wayne Pivac said: "I thought it deserved a card." New Zealander Pivac and Ospreys backs coach Gruff Rees both had issues with how the Pro12 Welsh derby was officiated. After hosting Ospreys on Saturday, 3 January, Scarlets travel to Glasgow in the Pro12, followed by a crucial European Champions Cup match against Leicester on Friday, 16 January.